...solid-state Ku-band block up converter (BUC) designed for transportable satellite communications uplinks. 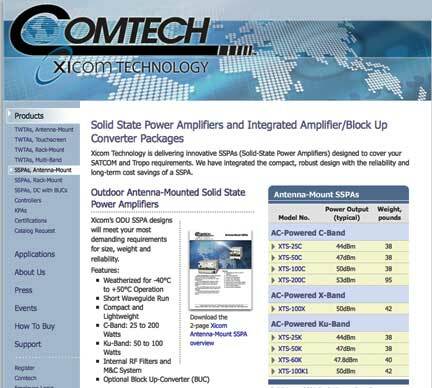 The Comtech Xicom Technology Model XTS-40KHE-B1 is the perfect solution for commercial and military users ready to take advantage of available Ku-band capacity. It offers 40 Watts of P1 output power and provides 20 Watts of linear power. Breakthroughs in efficiency enable the self-cooled, feed-mountable, amplifier to consume only 210 Watts when operated at linear power. The new XTS-40KHE-B1 is packed full of performance features including temperature compensation, gain control, harmonic filtering, receive-band filtering, and an output isolator. All this comes in a compact outdoor unit (ODU) weighing less than 10 pounds and measuring only 11.2 inches long x 4.4 inches high x 5.4 inches wide.